I bought this silicone mold at 100yen shop (Can☆Do). 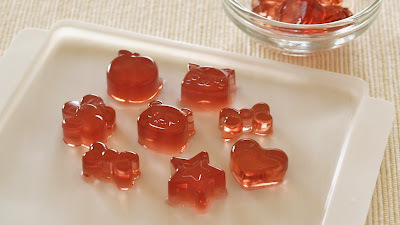 I followed the microwave gummy candies recipe that came with this mold and it just worked perfectly. 1. Put juice, gelatin powder, and lemon juice in a mug. Microwave at 500W for 30 seconds. 3. Pour it into a silicone mold, and drop it lightly on the counter for 2-3 times to raise the air bubbles. *You can wipe off the white air bubbles on the surface with a paper towel! 4. Cool in the fridge for about 30 minutes until completely set. They can easily get soft at the room temperature, so please keep them in the fridge.